Species differences should also be considered when discussing dopaminergic projections to the cerebral cortex (Fig. 1b). In rodents, mesocortical dopamine projections arise almost exclusively from the ventral tegmental area (VTA) and terminate mostly in prefrontal regions. The primary motor cortex, where a large population of PT neurons is located, is only sparsely innervated by these fibres. 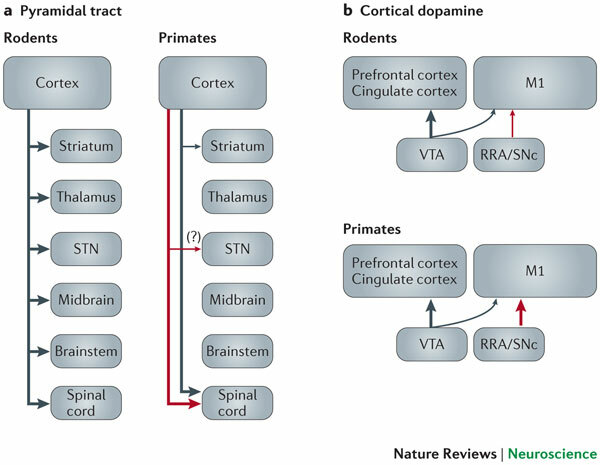 By contrast, primates (including humans) have gained a substantial dopaminergic innervation of M1 and related motor cortices7, 8; this innervation has arisen in large part from the substantia nigra pars compacta (SNc) and the retrorubral area (RRA)9, 10, thereby suggesting a prominent role of cortical dopamine on PT neurons in the M1 of primates, but not in rodents. So if that’s your thing, you should go read it. Does theory in neuroscience have any empirical content? I once took an economics class where the professor, a theorist, spent most of time harping on whether a given theory had “empirical content.” That is, he wanted to know whether a theory was falsifiable. After all, if we want to say something is scientific then it must be falsifiable. Let’s remember, too, that this isn’t purely something that theorists should be concerned about. Any time that an experimentalist suggests a working model for how something works, they are proposing a theory, whether that theory contains moving mathematical parts or not. This came up when we were discussing a theory paper last night. This paper suggested that populations of neurons can use excitatory feedback to reduce noise without worrying about runaway excitation. Interesting, but when I asked how we would falsify these people were a bit stumped. The lack of clarity on what are the exact assumptions and when it breaks down are common in theoretical papers in neuroscience. Does adding in an additional (biologically-plausible) set of recurrent connections break the model? Does this require a gaussian distribution of connections? And in many models: does this come from a specific set of parameters and is there anything the model could not fit? The problem with theories lacking empirical content is that they cannot be tested. And if they cannot be tested, why listen to them? As part of a great series of posts, Dynamic Ecology tries to answer whether ecological theory is useful for solving practical problems and whether the ecological literature is ‘idea free’ (ie, whether experiments are driven by a desire to test theoretical predictions.) If neuroscience had to face that test, I think it would do decently on the first question but horrifically on the second. How often do you read papers that are directly responding to theoretical predictions? Just like plants and animals, cities compete with each other and attempt to take advantage of the local environment in which they find themselves. Some cities are founded on oceans or rivers, others on plains, mountains, deserts or at the crossroads of trade networks. Yet, just like any organism that may find begin itself in an advantageous environment one day and find its environment transformed the next, the fundamental geographic advantages of cities can shift. Around the dawn of the first millennium Rome conquered and subsequently urbanised areas, including those that make up present-day France and Britain (as far north as Hadrian’s Wall). Under the Romans, towns in France and Britain developed similarly in terms of their institutions, organisation, and size. Around the middle of the fourth century, however, their fates diverged. Roman Britain suffered invasions, usurpations, and reprisals against its elite. Around 410CE, when Rome itself was first sacked, Roman Britain’s last remaining legions, which had maintained order and security, departed permanently. Consequently, Roman Britain’s political, social, and economic order collapsed. From 450-600CE, its towns no longer functioned. The Roman towns in France also suffered when the western Roman Empire fell, but many of them survived and were taken over by the Franks. …Medieval towns in France were much more likely to be located near Roman towns than their British counterparts (Figure 1). These differences in persistence are still visible today: only three of the 20 largest cities in Britain are located near the site of Roman towns, compared to 16 in France. Cities exhibit a ‘path dependence’, where their fortune is linked to the experience of their specific history. Of course, they can impact their own environment in ways that can manifest physically – such as through the building of canals – or the establishment of trade networks and specialization. They can even spawn the growth of nearby towns to create their own trading microenvironments. After years of research, the couple came up with their label for the theory during a visit to the remote area where Henry Markram was born, in the South African part of the Kalahari desert. He says “intense world” was Kamila’s phrase; she says she can’t recall who hit upon it. But he remembers sitting in the rust-colored dunes, watching the unusual swaying yellow grasses while contemplating what it must be like to be inescapably flooded by sensation and emotion. That, he thought, is what Kai experiences. The more he investigated the idea of autism not as a deficit of memory, emotion and sensation, but an excess, the more he realized how much he himself had in common with his seemingly alien son. Simon Baron-Cohen, who directs the Autism Research Centre at Cambridge University, told me, “I am open to the idea that the social deficits in autism—like problems with the cognitive aspects of empathy, which is also known as ‘theory of mind’—may be upstream from a more basic sensory abnormality.” In other words, the Markrams’ physiological model could be the cause, and the social deficits he studies, the effect. He adds that the VPA rat is an “interesting” model. However, he also notes that most autism is not caused by VPA and that it’s possible that sensory and social defects co-occur, rather than one causing the other. I certainly do not know enough to comment on the merits of the theory. The crying was associated with a sorrowful facial expression, sobbing body movements, and a voice inflected with sadness. These physical manifestations ended with the termi- nation of stimulation and the patient described feeling sad, but could not express the trigger for the sadness or crying. Results were consistent and reproducible. I have previously wondered why we cry, from a biological perspective. When I went looking for reasons, I found a paucity of actual evidence. However, in a link from a recent report on sticking electrodes in people I found a study that was able to induce crying. Causing a person to cry by electrically stimulating a part of the brain is about as good as you can get, right? Then you have causal evidence that that region is intimately involved in that behavior. To recap, when an epileptic patient needs surgery, an electrode will often be stuck in the brain in order to localize the source of the seizures. Scientists are always thrilled about this because it’s next to impossible to get an electrode in a human brain otherwise, and how else are we to study human-specific behavior? So they get into these operations and zap portions of the patient’s brain to see what it does – and what qualitative feelings the patient experiences. One recent such zapping managed to reliably produce crying in a patient – and not just crying, but crying with a feeling of sadness. This isn’t like what I had reported previously, where crying was the result of very deep areas that may not be directly linked to ’emotion’. The area of the brain they were stimulating was the ‘left posterior orbito-frontal gyrus’, which is a region of orbitofrontal cortex and looks to me like it may overlay the ventromedial (or perhaps ventrolateral) prefrontal cortex? This area has strong connections with amygdala and hypothalamus, as well as other reward-related areas. So activation of this area of orbitofrontal cortex is sufficient to induce crying and sadness. But is the crying directly caused by this stimulation? Or is it indirectly induced by the feeling of intense sadness? I’ll admit to being pretty interested in what the pathway is here, and then: what is the pathway that causes this area to activate? Also, three cheers for the surgeon whose job it was to repeatedly and remorselessly cause this patient to cry and feel intense sadness! I can trace my interest in neuroscience quite directly to when I was nine and my teacher showed us a video of the famous Penfield Experiments (see above, I’m pretty sure this is exactly the clip that I saw.) By directly stimulating the brain and asking patients what they saw or felt, Penfield was able to learn about the brain in ways that studying animals could not. And much more charismatically, too. Although it can be tough to convince an ethics panel that you should be allowed to open up someone’s brain to prod it with an electrode, people with epilepsy often have electrodes implanted as a way to localize the source of the seizures. And while the surgeons are in there implanting the electrode, why not spend a little time zapping things? When such a procedure was used to stimulate a region in the anterior cingulate cortex – roughly, an area just behind the front and center portion of your brain – they found an area that they describe as inducing the ‘will to perservere’. I can’t embed it in this page, but go and watch the video of the patient describing what it feels like. Can you believe it is December already? I addressed the difference between ‘learning socially’ and ‘social learning’. I find the idea that behavior can adapt without any direct learning occurring to be quite fascinating. I also discussed how visual object recognition can improve when other modes of information, such as semantic concepts, are added. Finally, I discovered that I am either a liar or a crackpot. David Dobbs wrote an article titled ‘Die, selfish gene, die’. My impression was that the idea that he was attack was not the one that is presented in the book The Selfish Gene, but rather some kind of strawman. In fairness, Dobbs backtracked on his twitter pretty quickly and clarified his point by restricting it quite heavily. While the writing is undeniably great, the article itself is fairly misleading which leads me to wonder whether that makes it good or bad science writing? I was going to post on it, but my fear got the better of me and I decided I didn’t know enough evolutionary theory to feel comfortable attacking the article. Jerry Coyne does the job that I wanted to do, with more authority though probably also more venom. The average grade given at Harvard is an A, and one professor is ‘bravely’ fighting that grade inflation by giving a second private, meaningless, grade. The role of genes in learning across species; a great new blog! A shepherd has 120 sheep and 5 dogs. How old is he? When kids are taught to a test, the problem-solving skills they develop are not necessarily the ones that you want them to. The Stanford Prison Experiment is widely cited, but remember that the average is not the whole: individual participants reacted in very distinct ways. No, humans are not chimp-pig hybrids. Apparently that was a possibility? Why do I always wake up 5 minutes before my alarm goes off? I find that I can do this on trips even when it is not my normal waking-time. Upping your theory game. Something that neuroscientists really need to do. Apparently, inquiring minds want to know: are researchers working on herpes?